Y2K was a busy year for MLQ. The collage above shows a few of the projects we've worked on individually and corporately during the past year, along with some of the members of the Maple Leaf Quilters guild. What a talented bunch of women! Monday, January 8, 2001, 7:00 PM. Sew What/Business Meeting. Monday, January 22, 2001, 6:30 PM. Charity Quilt Sewing. Bring your sewing machine. Saturday, February 24, 2001, 2 PM. Weekenders Clothing Party. (Location to be announced). This is a fundraising event for Maple Leaf Quilters. You'll love the comfortable and easy-to-care-for clothes available through Weekenders. A percentage of what you spend will go to our treasury. Guests are VERY welcome! Monday, February 26, 2001, 6:30 PM. Machine Quilting with Connie Ozinga. Bring your sewing machine. Saturday, March 24, 2001, 9 AM- 4PM (with lunch break). Help is Here for EQ4 Seminar with Barbara Vlack. This is a hands-on opportunity to learn from a great teacher and Electric Quilt software expert. We will be using a computer lab for this seminar so each person will have the opportunity to follow along step by step on a computer, creating quilt designs with EQ4. If you own this quilt design software and would like to become proficient OR if you are considering purchasing this software, you won't want to miss this seminar. Space is limited so sign up now. The cost is $40 for this six-hour seminar. For more information, please contact Nancy Smith, at 293-3846 or e-mail Aztech.@prodigy.net. For more information about EQ4, visit their web site: http://www.electricquilt.com/. Monday, March 26, 2001, 6:30 PM. Regular Meeting - activity to be announced. CHARITY QUILT PROJECT. Fran Hathaway has agreed to head up the Charity Quilt Committee. Our first offical project for 2001 is making blocks for a quilt for the annual Michiana Relief Sale in September. This will be our third consecutive year providing a quilt for the auction. 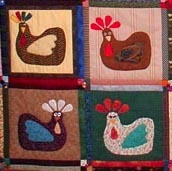 We've decided to make a whimsical quilt this year using the hen pattern, shown here, from the book Whimiscal Quilts. Information and patterns are available from Fran. Deadline for the 12 1/2" blocks is the January 22 meeting. FAVORITE ONLINE QUILT LINKS. 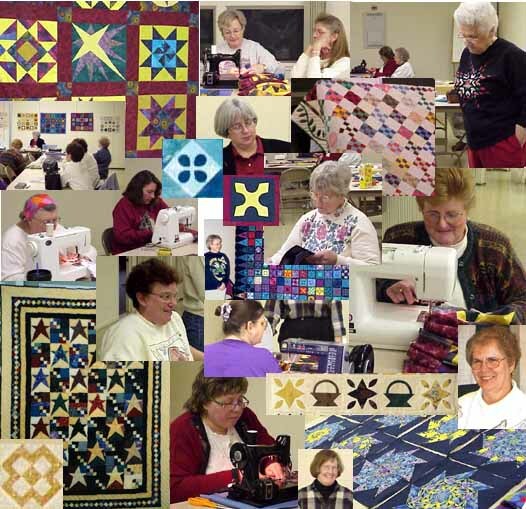 In each edition of this newsletter I've been featuring an favorite quilt site on the Internet. This month I would like to share another one of my favorites. Paper Panache is a web site created by Linda Worland. This very talented quilter/designer has created paper-pieced designs that you won't find anywhere else on the Internet. She regularly posts free mystery blocks and frequently updates here site so you'll want to visit regularly. The current site shows a number of great border ideas - ribbons and hearts that would be nice for Valentine's Day. Stop in and tell her Carol sent you! Here's the link: http://www.paperpanache.com/. 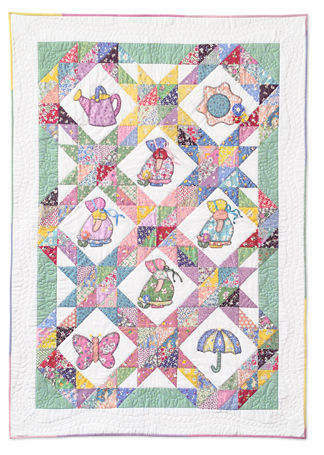 The second site I'd like to share is that of Keepsake Quilting. Keepsake has had a quilt catalog that has been popular for many years, but the website offers more than fabrics and patterns. Currently two free patterns and instructions are available. One pattern is for a Screenquilt, a cover-up for your computer monitor. . . very nice! The second is a Sunbonnet Sun Crib Quilt (pictured here). Patty Sliney has used this pattern for a twin-sized quilt which she showed at the Sew What Meeting at her house this summer. It was beautiful. Visit there site at: http://www.keepsakequilting.com/ and click on the Project Corner link for these two free patterns.